Regular readers of our Blogs will recognise that our work is cyclical with the same sites appearing each season and with similar work being undertaken. For us volunteers such visits mark the progress of the year and enable us to see the fruits of our labours from previous seasons. Swardeston Common is a good case since we visit here throughout the year working on different sections – the meadows in the Summer and woodlands in the Autumn and Winter. It is one of our favourite sites because of the diversity of habitats and the visible impact of our work to support them. The blackthorn will occupy us (and our successors) for many years because what we remove now will grow back for next year and will need to be cut back and continuously managed in years to come. Much of the blackthorn has reached the end of its life growing “leggy” and collapsing onto its neighbours. Nightingales visit the Common and prefer a denser ground covering habitat provided by younger blackthorn and other scrub. 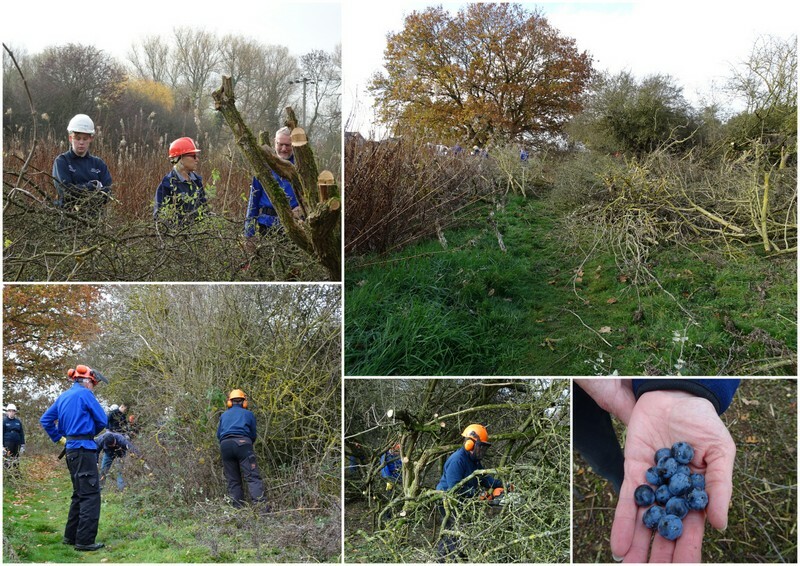 One our previous blog “Swardeston Common – Blackthorn Clearing” tells the story of the nightingales at Swardeston. On our seasonal visits we work through different sections of the old blackthorn and coppice this back to ground level. It will reappear next year with very sharp and spiky thorns and gradually get taller. It is worth repeating that blackthorn is nasty stuff constantly trying to stab or scratch you and getting tangled in your clothes. It can also be wet and slimy so difficult to get hold of and makes a mess of everything. But us “old hands” are used to this and work carefully through the thickets cutting and dragging out the branches ready to be burned. It burns really well and creates very hot fires. Our Thursday group under the supervision of Paula, started work on our blackthorn section for this year firstly clearing an area for the fire and then gradually cutting back around this. We had a good team out who today worked diligently through the section. The fire lit easily and was soon burning fiercely. It continues to surprise us how much we can clear by the end of our day. Tea break was a bit of a cake-fest since Paula had made her Tiffin (recipe can be found on our website here), Rebekah had made shortbread biscuits and I contributed freshly made fruit scones flavoured with sloe gin (sloes which has been picked at Swardeston the previous year). I also picked enough sloes for next year’s batch of gin and Liz collected a large bagful on Friday. It is much easier to pick the sloes from the cut down branches instead of reaching high into a thorny tree. 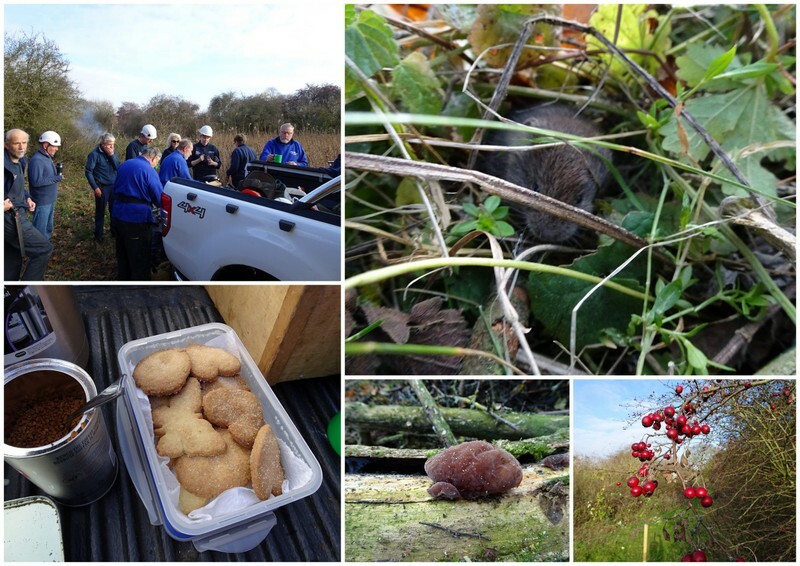 As we finished on Thursday a vole was spotted foraging around the site. Probably collecting fallen berries but also trying to re-orientate itself to the new open habitat. Robert got a few close-up photos. The vole was still foraging as we finished so was not deterred by our presence. As usual the robin flew in to examine our work and root around the disturbed soil for food. There is plenty of interesting fungi, lichens and other flora around this time of year as well as sloes and hawthorn berries. 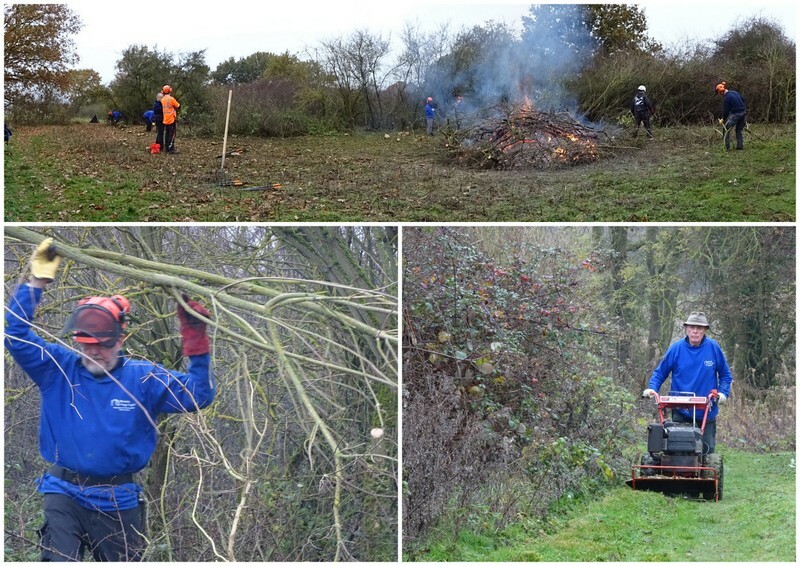 On Friday Matt was in charge and we continued working through the site cutting and burning the blackthorn. Alan ran the mower round the paths to tidy up the edges ready for winter. Student Alvin joined us from Easton & Otley College to start his work experience with us “old folk”. Matt always talks about creating “age structures” to our sites so that the trees are at different stages and heights to provide a more natural environment. We also have an age structure within our volunteer group and (mature) apprentice Pete remarked that he enjoyed coming along to our sessions because it made him feel young. Many of us are retired but still have plenty to offer and working outside is a great way of socialising and keeping fit while also helping the environment.